The Faraway Tree Stories and My Nuclear Birthday Cake – The Bookshelf of Emily J. The Faraway Tree Stories (1939, 1943, 1946) by Enid Blyton have potential. Upon receiving my copy of the book, which contains three books in one, I felt excited to begin reading these children’s stories which seemed to be about exciting adventures in the forest. That’s exactly what they are about; however, the stories are meant for somebody a sixth of my age. I did not enjoy them much. Yet, I was forewarned. Childtastic Books recently ran a post on Enid Blyton, to which I commented that I had wanted to read her work and that I had a hard time getting a hold of it in the United States. She warned me not to start with The Faraway Tree Stories, but because they are number 90 on the BBC book list, I did not listen. I should have. The stories are made up of three books: The Enchanted Wood, The Magic Faraway Tree, and The Folk of the Faraway Tree. While all of these titles sound exciting and imaginative, the actual execution of the stories was anything but. The stories are formulaic, dry, predictable, plagiaristic, and accompanied by rudimentary illustrations. 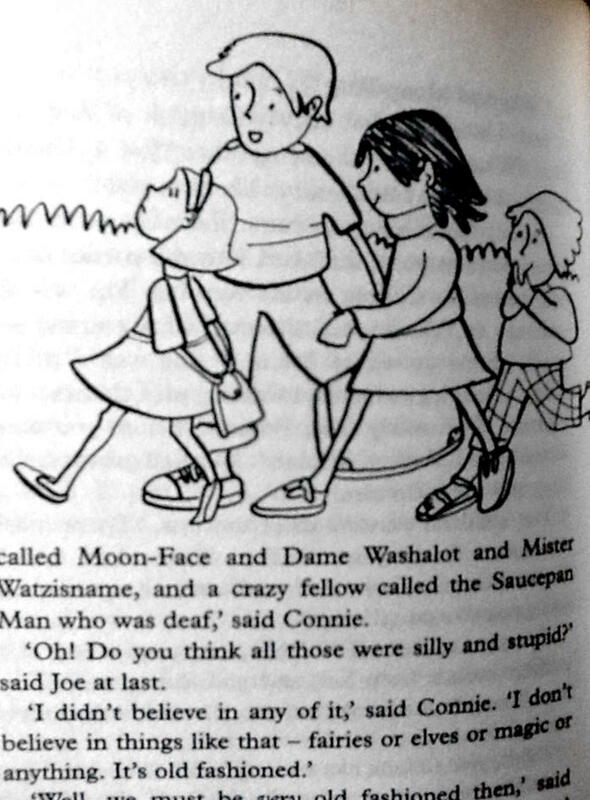 As you can tell, I did not enjoy the 583 pages I spent with children Joe, Beth, and Frannie as they constantly got into trouble with Moon Face, Silky, the Saucepan man, and others. 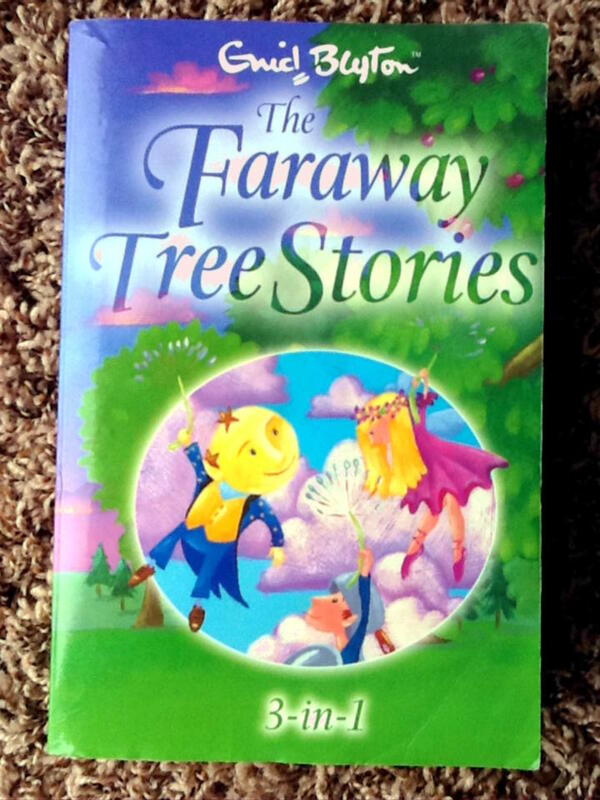 The general gist of each few chapters (or story) is that the three children go to visit their friends (Silky the fairy and Moon Face, the strange man with a moon face) in the Faraway Tree. At the top of the tree is a large cloud, and if the children go through that cloud, they enter another world. Such worlds include: The Land of Take-What-You-Want, The Land of Topsy-Turvy, Birthday Land, The Land of Toys, The Land of Tempers, The Land of Enchantment, and The Land of Secrets. As you can see, there is a lot of room for the children to meet interesting people and also to get into a lot of trouble. Of course, they get into trouble. A story isn’t any good without conflict and resolution, so the children are constantly getting stuck in these lands, making the residents of the lands angry or breaking the rules. The most common conflicts they face have something to do with gluttony or an inability to control themselves. They are constantly warned against going certain places and doing certain things, but they do them anyway. And with how much food they all eat in these lands where wishes come true, everybody in the book should weigh about 300 pounds by the end. Although I did not enjoy the books, I don’t think that makes them bad. I think it makes me old. These books are written at a young child’s level and are written like fairy tales, in which detail and description do not abound, but in which problem solving is the major part of the story. Fairy tales are good for children because of this, and as Albert Einstein said, “If you want your children to be intelligent, read them fairy tales. If you want them to be more intelligent, read them more fairy tales.” Blyton’s books definitely fall into this fairy tale category. The other great part of these stories is that the three children tend to be escaping a somewhat difficult home life. Their parents are kind, but the family is poor and the children often work hard and go without. In the Faraway Tree, they have the opportunity to escape, to bring home items they would normally not be able to have, and to make friends. Children’s stories that promote this sort of escapism are endearing to me. This seems especially appropriate for Blyton’s books because they were published during World War II. However, by the second book, the children are sneaking out at night without their parents’ knowledge. I’m not sure if I like that. As I read about Birthday Land, I couldn’t help but be reminded of one of my least favorite birthdays. It made me long to be with the children, eating the cake that really granted wishes and having all of the food in the world to choose from. This particular least favorite birthday (there are many) occurred when I was seventeen. My mother told me to make my own cake. (If this sounds odd to you, read my Tiger Mother post). I did make the cake, and because my favorite color is purple, I tried to make purple frosting. (This was before you could buy purple food coloring. I had to mix the red and blue droplets together.) The frosting came out an ugly grey color, so I sprinkled some colorful nonpareils on top to make it more festive. Well, my family saw my handiwork and began calling it nuclear cake. (This event also evokes memories of the time I made brownies that were rock hard.) They all laughed at me, and even told my boyfriend about it. I hated that birthday. Well, I don’t feel inspired to read any other Enid Blyton books, ever. However, I know that these stories are not her best work, nor are they the most representative. If you are familiar with her, what should I read instead? I’d like to give her another chance. Who Read My Library Book? It’s odd because while I devoured Enid Blyton’s books when I was young I never came across these stories until I read them with my daughter. I am a huge fan of Blyton but really didn’t like these at all and found them quite boring. My daughter, on the other hand, was entranced. I think age is the key here: if you’re 4-8 years old you stand more of a chance of liking them. Otherwise they just are repetitive. Having read many more Blytons with my daughter, I have come to the conclusion that she is very much meant to be read by children. This sounds obvious but what I mean by it is that she totally gets what children think about, what they are motivated by, their strengths and weaknesses. As adults we want different things from stories and when I went back to reread them at my age I winced at many things that didn’t bother me as a child. There is a heck of a lot of stereotyping in them – girls make the tea, boys scout for firewood, only children are spoilt brats, Americans are generous and friendly but vain, etc… But I think when children read them they just want a good plot that cracks along at a great pace and she provides that. She was a storyteller I think more than a literary writer. 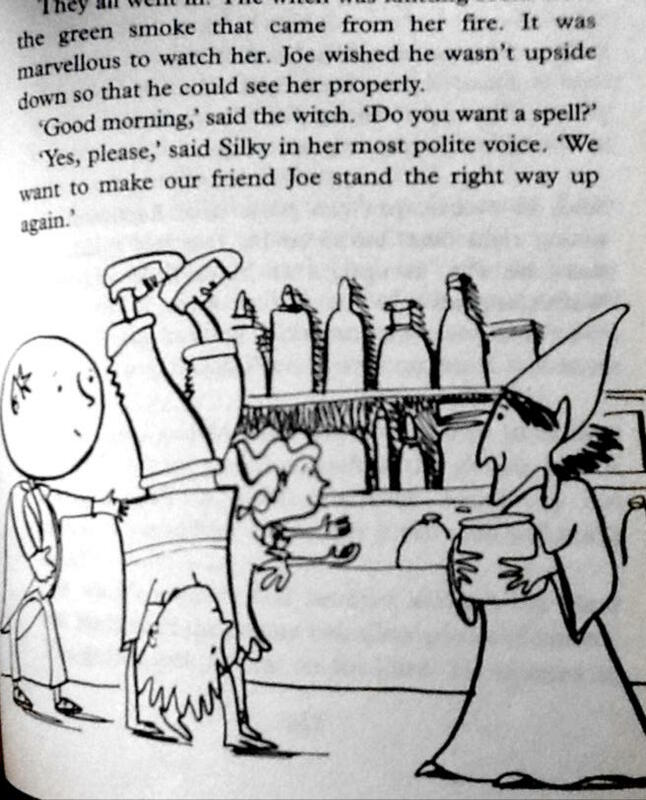 Children don’t care if characterisation is strong – they like predictability and excitement. If you want to pursue with her, I would recommend The Famous Five (this does seem to be popular with many people) and possibly the Malory Towers or Twins at St Clare’s series, if you like boarding school tales. Definitely the Famous Five though. Good adventures, and mouthwatering descriptions of scrummy teas! From what little you’ve said she feels a little like Gertrude Chandler Warner. A little formulaic but I still enjoy her books as long as I read them from a child’s perspective and see the magic. Good advice. I haven’t heard of Warner, but I was NOT reading with a child’s perspective. I was reading with the goal of getting it checked off my list. My bad. I understand; sometimes I read a book just because I said I would but I enjoy a book more if I read it because I wanted to and the timing is right (I often have to put a book down and go back to it later because I’m just not in the mood). In any case, I’m excited to be a big Prize Winner, and my kids and I will have fun reading the book together, especially knowing it came from you. I hope there’s a big stain on Page 238. I’d like to enter the giveaway. 🙂 I like reading children’s books (my husband makes fun of me). It’s probably because when I read for enjoyment I’d rather not think too much. I’d never try to say that my literary taste is very sophisticated. I am really looking forward to reading more books with my daughter. She turns 3 years old in about a month and I think this may be a good book to read together in another year. (Although I must admit that you do make me a little worried about the sneaking out at night part – I don’t want my girl to get any crazy ideas). Ha! I bet your daughter would like these stories. As to the pencil notes, they are gone already! Thanks for entering. And won’t I be seeing you on Thursday? I hope so. It’s been a while. Too long. Emily, you should watch the BBC movie ‘Enid’ with Helena Bonham Carter in it. It is so good! I didn’t know about it, but I do now. Thanks! I will put it in my Netflix asap! Thanks, Jennie! Netflix doesn’t have it. Do you? Can I borrow it? I’m fond of the Malory Tower books. But that’s probably more because I have a soft spot for boarding school books than because they are great books. They’re definitely children’s books and they are definitely formulaic. On the other hand, they’re fun and they do shed a lot of light on upper-class British values for children’s behavior at the time. Being sporting and loyal and honest is most important, academics somewhat less so. And feeling cold is an indication of weak character! How interesting. Feeling cold equals weak character? I guess that would be me if I were in her books. I’m always cold! Thank you! I will look into the biography. She’s written for very small children (Noddy and Big Ears) and books for older children, up to about 10 years old at the maximum. She’s written fantasy series drawing on English country lore and fairy creatures. I remember the Eight o clock tales, Six o clock tales etc and the Mr Pink Whistle series. She wrote children’s mystery and adventure series such as Famous Five and the Five Find-outers and Secret Seven etc. Of those I liked the Five Find-Outers the best. My favorites however were her school series -set in made up girls boarding school such as the St Clare and the Mallory Tower series. Perhaps because of the times she wrote in, she often typecast girls and boys into specific roles and as I grew older I did not appreciate that. In her boarding school series however, the girls are empowered and do daring things, have midnight feasts, play tricks on their teachers, put on plays and sports etc. while also developing friendships and their characters. (Still formulaic? Yes.) She also wrote a circus themed series (Mr. Galliano’s circus) that I used to love as a kid – lots of animals and fun stuff. The stories are typically set in villages and reflect the lives led back then as well as British values like the famous stiff upper lip. In recent years, in spite of her huge popularity and longevity, Enid Blyton’s been criticized by feminists (I saw that coming) and even called racist (that mystifies me). She never won any literary prizes as far as I know, but she’s a great kid’s storyteller. I myself have to try the film and biography as I missed both – thanks. I was never fussed on Blyton, but my mum won’t hear a bad word said against her. I did enjoy the Famous Five when I was a kid, but I do think it is an age thing. Plus, like someone else said, the context of when she was writing. I do remember preferring C.S Lewis and Beatrix Potter. I am consigned to the fact that it is an age thing, but at the risk of offending your mother, shouldn’t really good and enduring children’s literature be interesting to adults as well? I’m thinking of Harry Potter (definitely for older children), Frances Hodgson Burnett, or Beverly Cleary. Those are all books that I enjoy reading to my daughter. To be honest, I think it is a fondness thing for my mum. And it was always my dad who read to me – books I picked out – when I was a kid. She teaches primary school, but I don’t think she reads many novels to them, or even books like Blyton. I think she tends to stick with more fables and short stories. Perhaps Blyton is more interesting if you have strong fond memories of it as a kid? If you remember being entranced by the books when you were a child, maybe some of that magic returns when you read it to kids, too? Pingback: Girls’ Studies: My Super Sweet Sixteen | The Bookshelf of Emily J.